There’s nothing more comforting than a slow cooked stew. Get it all ready, turn on the slow cooker, go out for a long walk in the cold and then come home to a house full of delicious smells and a gorgeous, hot and healthy meal ready and waiting. Yum! Put the flour on the beef and mix well. Heat the olive oil in a large frying pan and gently fry the beef until brown. Place the beef in a slow cooker. Then add the leeks, celery, onions and garlic into the beef juices and stir, gently fry until soft (about 4 minutes). Add to slow cooker. 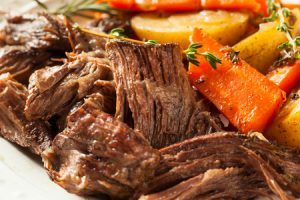 You don’t have to fry the beef and veg first, you can just put in the slow cooker, but it gives a better flavour. Put everything else into the slow cooker as well, and stir well. Put on the lid, and allow to bubble away on a low setting for around 5 to 6 hours, or on a higher setting for faster cooking for 2 to 3 hours. Check the beef is nice and tender – it should just fall apart and not be at all chewy. The lower and slower you cook it the better. Serve with creamy mashed potato and some steamed broccoli on top.